I had a pâton of pâte sucrée in the fridge. And a little bag of roasted pistachios a friend brought back from Lebanon. And of course, too many apricots sitting on the counter. An hour later, all this turned into a tart. The kind of tarts that are simple and rustic. And yet, ever so delicious. We had a piece still warm from the oven for lunch. And another for dinner, after a baguette garlic steak sandwich that was so good I want to remember it forever. Inside, thick slices of juicy steak with plenty of grated garlic, a dollop of cancoillotte, and salad leaves from the garden. With a glass of rosé and a few radishes we’d just picked, it was fairly close to the perfect summer dinner. A few hundreds kilometres away, my friend Anna-Sarah* is having her very own perfect dinner. On a péniche [houseboat] with never-ending glasses of champagne. It’s her birthday and I wish her the happiest one ever. And if I’m lucky enough, I might even join her on the boat next week-end. Just before I fly back to London. And step into whites again. At the Capital, to give a hand to my friend Richard Hondier who’s now running the kitchen and plating the most delightful dishes I’ve ever seen. And really, I can’t wait. 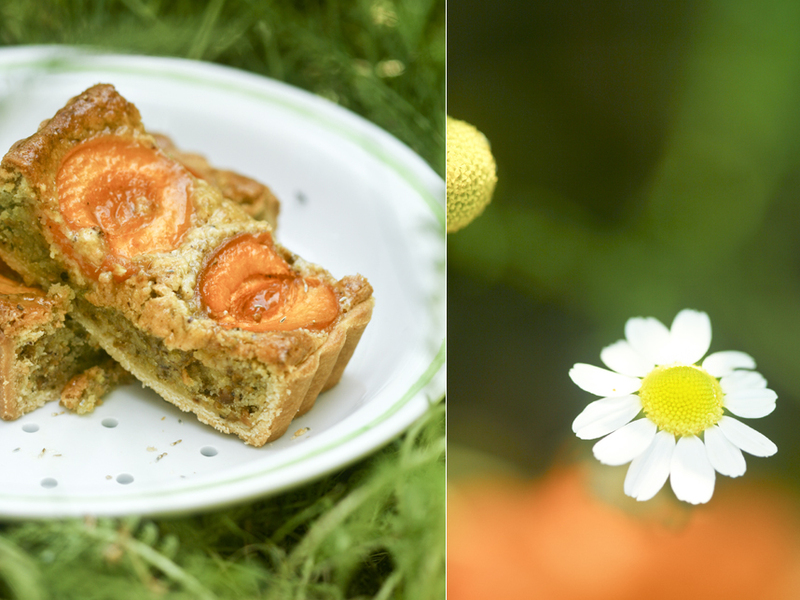 * You might know that Anna-Sarah hates apricots, she’s already told me off when I posted this a few days after she’d left (of the I-see-you’re-waiting-until-I’m-gone-to-write-about-apricots kind), so sharing an apricot recipe on her birthday, let’s hope she forgives me! This tart is super-quick to put together. Especially if you have some pâte sucrée ready in your fridge or your freezer. I know I always do, and this way, dessert is almost always less than an hour away. There is nothing tricky. Pastry, crème d’amandes, fruits, and a little glaze. Ah, yes, just a quick word on crème d’amandes, a stapple in French pâtisseries. I forgot to include it in this list, and really it should be there. The mistake has been corrected since more often than not, you’ll find crèmes d’amandes that feeleither too buttery or too spongy. And most of the times, it even gets called frangipane, and trust me, crème d’amandes in no frangipane. To make a gorgeous crème d’amandes, you just have to make sure the eggs are at room temperature. I keep my eggs in the fridge, so they never are. If you add them fridge-cold to the creamed butter, the mixture will split and might leak butter during baking. The trick I use is so simple it hurts. I just place the eggs in hot water – of the tap kind – while I cream the butter and sugar for several minutes. And then, one egg at a time, with a good two minutes of beating in between to bind the emulsion, and make it smooth and airy. Cream the butter, sugar, salt and vanilla extract for a few minutes, until light and fluffy. Add the ground almonds. And the egg and beat well for around 3 minutes. Tip in the flour and mix until just combined. Flatten the dough and wrap in clingfilm. Chill for at least 3 hours – or up to 5 days – before using. Or keep frozen, for up to 3 months. On a lightly floured work surface, roll the dough into a 4mm-thick rectangle. Carefully wrap the dough around your rolling pin and place on top of a 10x30cm tart tin. Line the tart case with the dough, then trim the edges. Place in the freezer while you get on with the crème d’amandes. Cream the butter and sugar until light and fluffy, for 8-10 minutes, scraping the sides of the bowl every now and then. Add the eggs, one at a time, beating well – at least 2 minutes – after each addition. Tip in the ground almonds and pistachios, then the flour and mix until just combined. Scrape the crème d’amandes into a piping bag fitted with a 12mm nozzle and pipe the cream at the bottom of the prepared tart case. 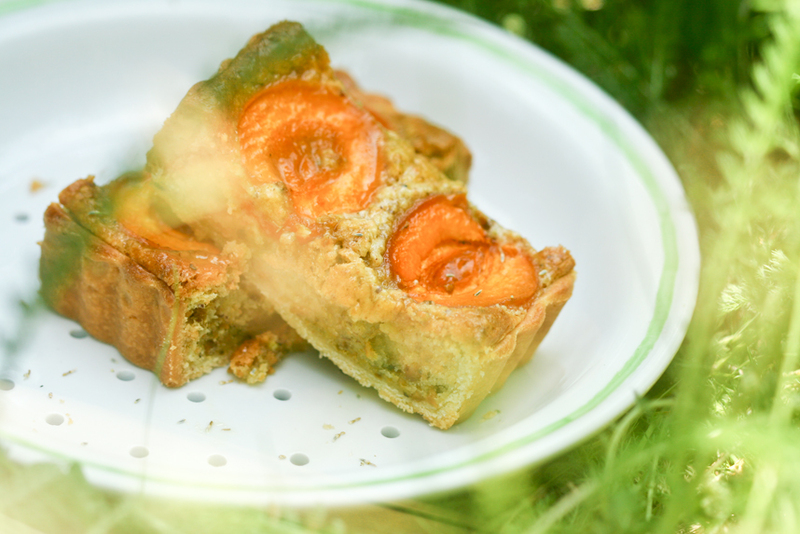 Arrange the apricots halves, cut-side up onto the crème d’amandes and bake for 40 to 45 minutes, or until golden brown. In a small pan, place the apricot jam with a little water (around a tablespoon) and bring to the boil. Gently brush this glaze over the hot tart, and allow the tart to cool down at room temperature. Slice into wedges and serve, perhaps with a scoop of ice-cream or a dollop of whipped cream. This looks soooooo good!! Can’t wait to try it!! Bravissima! This looks so delicious, pistachios make such a good addition to cakes and tarts..Will put on my ‘To Make ‘ list! that tart looks really divine! Wow, I have to try this!!!!!! So nice colour, and I’m sure, so delicious!! I’m going to make it this weekend, it will be a nice surprise to my family!! Hi! Excellent recipe! I loved the mix of apricot & pistache. I have one question about the dough: when I tried to wrap it around the rolling pin, the pâte started breaking in pieces, so in the end I pressed the dough down the tart tin with my fingers. I followed the recipe of the pâte sucrée, so I would like to understand what I did wrong or which ingredient was not “good”. Trop bien cette recette, la tarte abricot-pistache est ma préférée depuis que j’ai goûté celle de chez Paul. Mais je ne suis pas une grande cuisinière donc j’hésite encore à me lancer! En plus je ne suis pas fan de l’amande et j’ai peur que ça donne un effet “frangipane” ! On ne pourrait pas faire une crème de pistache sans amandes ? This looks delicious! May I ask what size eggs you use for this recipe? Thank you! thank you for sharing such yummy recipes!